These pages provide an overview of the Sun-Earth environment and a selection of the topics researched by Professor Graham Bailey. Professor Graham Bailey's published research papers are listed in publications. The region between the Sun and the planets has been termed the interplanetary medium. Although once considered a perfect vacuum this region is extremely turbulent and dominated by the solar wind. The solar wind is a plasma of charged particles coming out of the Sun in all directions at very high speeds (250-1000 km/s, i.e., about 600,000-2,000,000 miles/hour). It varies with the changing conditions on the Sun. The solar wind is responsible for the anti-sunward tails of comets and the shape of the magnetic fields around the planets. It can also have significant effects on the flight paths of spacecraft. The Earth's magnetic field is very similar to the pattern formed when iron filings align around a bar magnet. Under the influence of the solar wind, however, these magnetic field lines are compressed in the sunward direction and stretched out in the downwind direction. This creates the magnetosphere, a complex, teardrop-shaped cavity around Earth. The Van Allen radiation belts are within this cavity, as is the ionosphere, a layer of Earth's upper atmosphere where photoionization by solar x-rays and extreme ultraviolet rays create free electrons. The Earth's magnetic field senses the solar wind by its speed, density, and magnetic field strength. Since the solar wind varies over time scales as short as seconds, the interface that separates interplanetary space from the magnetosphere is very dynamic. Normally this interface, called the magnetopause, lies at a distance of about 10 Earth radii in the direction of the Sun. However, during periods of elevated solar wind density or velocity, the magnetopause can be pushed inward to within about 6.6 Earth radii. As the magnetosphere extracts energy from the solar wind the internal processes produce geomagnetic storms. Coronal mass ejections (CMEs) are gigantic bubbles of electrified gas that billow away from the Sun. They can carry as much as 10 billion tons of solar material and usually travel at speeds between 500 and 1500 km/s, taking 2 or 3 days to cross the 150 million km divide separating the Sun and Earth. CMEs can occur at any time during the solar cycle, but increase in daily frequency from about 0.5 during solar minimum years to about 2.5 around solar maximum. Fast CMEs, those which outpace the ambient solar wind, give rise to large geomagnetic storms when they encounter the Earth’s magnetosphere. Such storms can result from the passage either of the CME itself or of the shock created by the fast CME’s interaction with the lower-moving solar wind. The image to the right shows a Coronal Mass Ejection as observed by the SOho and Heliospheric Observatory ( SOHO ) on 9 March 2000. In this image, direct light from the Sun is blocked with the Sun's relative position and size indicated by the white half-circle. The field of view extends 2 million kilometres or more from the solar surface. Geomagnetic activity associated with CMEs can dramatically disrupt electrical and communications systems. CMEs can create voltage surges in electric power grids, disrupt radio communications and navigation systems, prevent normal satellite operations, and threaten the safety of astronauts. In 1997, for example, a geomagnetic storm shut down an AT&T Telstar 401 satellite that provided television broadcasts. 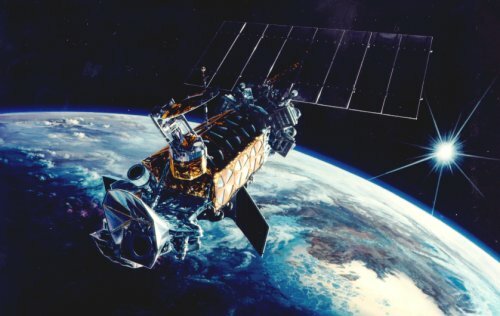 In 1998 another storm disrupted a Galaxy IV satellite that supported automated cash machines and airline tracking systems. Geomagnetic storms are also known to affect mobile phone operations and wireless internet services. The Aurora Borealis (Northern lights) and Aurora Australis (Southern lights) are streamers, arches, and curtains of moving light, often green or red in colour, appearing in the auroral regions. They are caused when the charged particles of the solar wind, spiralling down the magnetic field lines in the polar cusp, collide with oxygen and hydrogen in the upper atmosphere and raise these atoms to excited states. These excited states then relax with the emission of energy, often in the visible light or ultraviolet bands. Cameras aboard satellites can look down at the aurora and snap its instantaneous picture at some given moment. What they see is a roughly circular strip, centered a little nightward of the magnetic pole, known as the auroral oval. The auroral oval normally lies between 60 and 80 degrees latitude. However, during large magnetic storms the oval grows in size and may even reach the population centres of Europe and America in the northern hemisphere and Australia in the southern hemisphere. The aurorae provide pretty displays, but they are just visible signs of atmospheric changes that may wreak havoc on technological systems. A large CME swept past the Earth on 20 November 2003 and sparked bright auroras as far south as Florida in the United States and Greece in Europe. The selection of images displayed below were taken on 20 November 2003, following the passage of the CME. These images, and images from other days, are available from NASA . Plots showing the current extent and position of the auroral oval at each pole, extrapolated from measurements taken during the most recent polar pass of the NOAA POES satellite, are available from NOAA . The ionosphere is usually defined to be that region of the Earth's upper atmosphere where ionized particles are in sufficient numbers to affect the propagation of radio waves. It is produced by photoionization of the neutral atmosphere, arising from the absorption of solar extreme ultraviolet (EUV) radiation and x-rays, at altitudes between about 60 km and 600 km. At high latitudes, where the geomagnetic field lines are open, there are additional sources of ionization since charged particles from the Sun can interact directly with the neutral atmosphere. Within the auroral oval, precipitating energetic electrons are an important source of ionization. Solar radiation from the Sun is absorbed at different rates and frequencies at different altitudes in the atmosphere. This, along with the varying concentrations and composition of the neutral atmosphere, chemical production and loss processes, and dynamics, causes the formation of ionized regions that have very different characterictics. These regions are called the D (60-90 km), E (90- 150 km) and F (150-500 km) regions, with the F-region being subdivided into the F1 and F2 regions. The dominant ions in the D and E regions are NO+ and O2+. In the F-region, where the bulk of the ionospheric plasma resides, the O+ ion dominates. The ionosphere at equatorial latitudes is characterised by a trough in the latitudinal distribution of ionization at the magnetic equator with crests near ± 17° magnetic latitude. This feature is called the Equatorial Anomaly. It results from the east-west electric field at the magnetic equator giving rise to an upward E×B plasma drift during daytime (see left-hand figure below) where E is the electric field and B the magnetic field. This upward drift drives the plasma across the magnetic field lines to higher altitudes. The plasma then diffuses downwards along the magnetic field lines under the influence of gravity and pressure gradient forces. The net result is the formation of a plasma fountain, centred at the magnetic equator, which transfers plasma from the equatorial region to higher latitudes (see right-hand panel below). The crest-to-trough ratio in the peak electron density is typically around 1.5 near noon and around 3.5 during the afternoon period when the E×B drift velocity is high. The latitudinal locations of the crests increase with increasing upward E×B drift, which vary with solar and magnetic activity. The crests in both hemispheres occur at lower latitudes and become weaker with increasing altitude. Above about 800 km altitude the equatorial anomaly disappears; there is a single crest at the magnetic equator.The neutral wind causes the equatorial anomaly to be asymmetric about the magnetic equator. The Jicamarca Radio Observatory is the premier scientific facility in the world for studying the equatorial ionosphere. It is located in Peru at geographic coordinates 77°W, 12°S. The magnetic dip angle is about 1° N and varies slightly with altitude and year. The incoherent scatter radar is the principal facility of the observatory. The main antenna consists of 18,432 dipoles covering an area of nearly 85,000 square metres. The radar can be pointed perpendicular to B throughout the ionosphere. Of all the incoherent scatter radars, the Jicamarca radar provides by far the most accurate plasma drift velocity and electric field data. The figure below shows contour plots of the electron concentration (log10Ne) and the local time variation of hmax (altitude of maximum electron concentration) observed by the Jicamarca incoherent scatter radar on 1-2 October 1970. An important characteristic of the equatorial F-region is the sharp increase in hmax in the dusk sector. This increase arises from the dusk-sector increase in the upward vertical E×B plasma drift velocity just before it reverses to a downward direction. The prereversal enhancement in the vertical drift velocity is caused mainly by F-region dynamo effects. The sharp increase in hmax plays an important role in the occurrence in equatorial spread-F. The dotted region in the figure below denotes the occurrence of equatorial spread-F.
Contour plots of the electron concentration and the local time variation of hmax, the altitude of maximum electron concentration, observed at Jicamarca on 1-2 October 1970. The dotted region denotes the occurrence of equatorial spread-F. Plasma irregularities in the F-region caused by plasma instabilities are known as spread-F and can occur at all latitudes. However, spread-F in the equatorial region can be severe. At night, fully developed spread-F is characterized by plasma bubbles, which are vertically elongated wedges of depleted plasma that drift upward from the bottomside F-region to altitudes as high as 1500 km. The individual flux tubes in a vertical wedge are typically depleted along their entire north-south extent. The east-west extent of the disturbed region can be several thousand kilometres. The plasma density in the bubbles can be up to two orders of magnitude lower than the surrounding medium. When spread-F ceases, the upward drift ceases and the bubbles drift towards the east with the background plasma. The bubbles at high altitudes tend to lag behind those at low altitudes. At equatorial latitudes the conditions for the formation of spread-F and plasma bubbles are strongest during the dusk sector when the upward vertical E×B drift velocity increases rapidly. As the F-region rises in altitude and the bottomside ionosphere decays due to lack of sunlight steep vertical density gradients develop in the bottomside ionosphere. This produces the classical configuration for the Rayleigh-Taylor (R-T) instability, in which a heavy fluid is situated above a light fluid. A density perturbation can trigger the R-T instability under certain conditions. Once triggered, density irregularities develop and the field-aligned depletions then bubble up through the F-region. The F-region height and bottomside density gradient are not the only conditions necessary for the R-T instability and spread-F. Upward propagating gravity waves, which induce vertical winds, can trigger the R-T instability both by providing an initial perturbation and by affecting the instability condition. A meridional neutral air wind can stabalize the plasma. Above the F-region lies the topside ionosphere. In this region the most important ions are O+, H+, and He+. With increasing altitude H+ becomes the dominant ion (usually within the altitude range 1000-2000 km). The region where H+ is the dominant ion is called the protonosphere or plasmasphere, the latter being more appropriate since the region also contains significant amounts of the He+ ion. Theoretical models and observations dating back to the early 1960's have suggested the importance of He+ in the composition of the topside ionosphere. Early observations indicated that He+ may become the dominant ion over a limited altitude range during solar maximum, but may be of relatively little importance at solar minimum when H+ becomes the dominant ion at altitudes above 600 km. Observations made by the Arecibo Incoherent Scatter Radar have been used in many studies of the ionosphere and topside ionosphere. This radar is located on the island of Puerto Rico at geographic latitude 18.35°N, geographic longitude 16.75°W, and geomagnetic latitude 30°N. The main reflector dish has a diameter of 305 metres and a depth of 51 metres. It is the largest radar dish in the world. Suspended 137 metres above the dish is the dome that houses the Gregorian reflectors. These reflectors concentrate the signals received from the main dish before they are sent to the receivers. Further information on the radar and the Arecibo Observatory is provided by the web pages radar and observatory. Brief descriptions of how a radar works and how the Arecibo incoherent scatter radar makes measurements of composition, temperature, and velocity in the ionosphere are provided by the web pages measurements of the ionosphere. Observations of light-ion concentration made by the Arecibo Incoherent Scatter Radar have shown regions of He+ layering in the topside ionosphere in the post midnight hours. This phenomenon has been observed during both solar maximum and solar minimum conditions. As the figure below shows, during solar maximum the layer can contribute to more than 50% of the total ion concentration; during solar minimum its maximum contribution is only ~20% [Wilford et al., J. Geophys. Res., 108, 1452, 2003]. González and Sulzer [Geophys. Res. Lett., 23, 2509, 1996] have presented a formulation for the formation of the He+ layer based on ambipolar diffusion. Application of the formulation produces the net result that He+ is constrained from below by O+ and from above by H+. During the day this does not produce the layering effect since the transition region is relatively broad, allowing He+ to gather in a relatively large area. At night the transition region narrows, thus forcing the He+ into a smaller area and resulting in an increase in the fractional He+ concentration. Observations of H+ and He+ made at Arecibo. The left and right hand panels show absolute and fractional ion concentration respectively. The top and bottom panels show data for the hydrogen and helium ions respectively. A modelling study of the He+ layer carried by Wilford [PhD Thesis, University of Sheffield, UK, 2002] has shown the importance of the diurnal variation and value of the O+/H+ transition height in determining the location and characteristic features of the He+ layer. The SUPIM (Sheffield University Plasmasphere Ionosphere Plasmasphere) model was able to recreate the He+ layer observed by the Arecibo radar with reasonable accuracy. The SCTIP (Sheffield Coupled Thermosphere Ionosphere Plasmasphere) model, on the other hand, only recreated the He+ layer when the empirical formulation for the electron temperatures used by SCTIP, which was based on the neutral gas temperature and the solar zenith angle, and the temperatures of the individual ions, which are set equal to the O+ temperature, were replaced by formulations based on the SUPIM values. The SUPIM values are obtained by solving fully coupled energy balance equations for the electrons and for the O+, H+, and He+ ions [Bailey and Sellek, Ann. Geophysicae., 8, 171, 1990.]. Observations made by the Retarding Potential Analyzer (RPA) on board the DE-2 (Dynamics Explorer 2) satellite have revealed regions near 900 km altitude and 22.00 LT at mid and low latitudes where He+ is the dominant ion or dominant light-ion. The RPA was developed at the University of Texas at Dallas. It provides in-situ measurements along the satellite track of ion temperature and composition. The picture to the left shows the two DE satellites stacked in their launch configuration (DE-2 on top, DE-1 on the bottom). The figure below shows examples of He+ being the dominant ion (left panel) and dominant light-ion (right panel). Using values of ion concentration modelled by SUPIM, Bailey and Sellek [Ann. Geophysicae., 8, 171, 1990.] have shown the existence of altitude regions in the nighttime topside ionosphere for winter (see the following figure) and equinox during solar maximum where He+ is the dominant ion. Such regions arise from the nighttime decrease in O+ concentration combined with the nighttime maintenance of He+ and are most pronounced during winter when the high value of the winter helium bulge leads to enhanced He+ concentrations. Bailey and Sellek could find no evidence to suggest that He+ could become the dominant ion during summer at solar maximum or at any time during solar minimum. The DMSP (Defense Meteorological Satellite Program) satellites fly in sun-synchronous near-polar orbits at altitudes close to 830 km above the surface of the Earth. The orbits have an inclination of about 98 ° such that the plane of the orbit precesses with a period of about one year. This results in the satellite's orbit staying in roughly the same local time throughout the year. Each satellite has an orbital period of about 101 minutes, giving 14-15 orbits a day, each separated in longitude by around 25°. This orbital period, combined with the Earth's rotation and the polar orbit of the satellite, results in every portion of the Earth being imaged twice a day (once during the ascending leg and once during the descending leg). For scientific purposes, this is an ideal situation since it allows researchers to sample the ionosphere at polar, mid-latitude, and equatorial regions. Observations made by instruments on board the DMSP satellites have been used in many studies. In the following figure, taken from a study carried out by Wilford [PhD Thesis, University of Sheffield, UK, 2002], latitudinal variations of O+, H+, and He+ observed by the RPA on board the DMSP-F10 satellite are displayed. Also displayed are values determined by the SCTIP model. The good agreement in the modelled and observed values was obtained by increasing the He+ photoionization rate used in SCTIP by the factor 2.5. This factor is included in the He+ photoionization rate used by SUPIM following studies of DE-2 observations carried out by Heelis et al. [J. Geophys. Res., 95, 10,313, 1990] and Bailey and Sellek [Ann. Geophysicae., 8, 171, 1990]. Both the SUPIM and SCTIP models use the MSIS-86 values [Hedin, J. Geophys. Res., 92, 4649, 1987] for the neutral helium concentration. Since there is considerable scatter in the neutral helium concentrations used to construct the MSIS values and there is no evidence to suggest that the solar EUV fluxes and photoionization cross-sections are significantly in error then it is probable that the 2.5 increase in He+ photoionization rate could be obtained solely by increasing the neutral helium concentration. Results from the CTIP model superimposed on observations made by the DMSP-F10 satellite. Modelled values; O+ (+++++), He+ ( *****). Observed values; O+ (solid line), He+ (dash line). Averaged latitudinal profiles of the electron and ion temperatures, and the total ion concentration observed by the DMSP F10 satellite at 800 km altitude and 21.00 LT during January 1991 in three longitude regions. The vertical lines on the plots denote the standard deviations of the observations. Only the standard deviations of the electron temperature are displayed. The standard deviations of the ion temperature are similiar to those of the electron temperature. The figure to the right shows averaged latitudinal profiles of the electron temperature, Te, the ion temperature, Ti, and the total ion concentration observed by the DMSP F10 satellite at 800 km altitude and 21.00 LT in the longitude regions 0°-40°, 180°-210°, and 300°-340°. The observations were made during January 1991 when the solar F10.7 flux was around 220. The vertical lines on the plots denote the standard deviations of the observations. Only the standard deviations of Te are displayed. The standard deviations of Ti are similiar to those of Te. Values modelled by SUPIM [Bailey et al. Ann. Geophysicae., 18, 1435, 2000] confirm that the crests observed near 15° latitude in the winter hemisphere are due to adiabatic heating and the troughs observed near the magnetic equator are due to adiabatic cooling as plasma is transported from the summer hemisphere to the winter hemisphere. The modelled values also confirm that the interhemispheric plasma transport needed to produce the required adiabatic heating/cooling can be induced by F-region neutral air winds. The longitudinal variations in the observed troughs and crests arise mainly from the longitudinal variations in the magnetic meridional wind. At longitudes where the magnetic declination is positive (180°-210°) the eastward geographic zonal wind combines with the northward (summer hemisphere to winter hemisphere) geographic meridional wind to enhance the northward magnetic meridional wind. This leads to deeper troughs and enhanced crests. At longitudes where the magnetic declination is negative (300°-340°) the eastward geographic zonal wind opposes the northward geographic meridional wind and the trough depth and crest values are reduced. In the longitude region 0°-40° the magnetic declination angle is close to zero. The Japanese Hinotori satellite was launched in February 1981 into a near-circular orbit at 600 km altitude with an inclination of 31°. The orbital duration was about 90 minutes. The satellite operated until June 1982. The electron density was measured by an impedance probe [Oya et. al., J. Geomag. Geoelectra., 38, 111, 1986] and the electron temperature by an electron temperature probe [Hirao and Oyama, J. Geomag. Geoelectra., 22, 393, 1970]. The electron density and electron temperature measured by the Hinotori satellite during pass 3599 (20 October 1981). In the figure to the right are shown the electron density and electron temperature measured by the Hinotori satellite on pass 3599. The two shaded regions in the lower panel represent enhancements in the electron temperature ~600 K and ~1000 K at magnetic latitudes 8° and -9°, respectively, with respect to the background values (represented by a dashed curve). These regions coincide with the electron density enhancements of the equatorial anomaly displayed in the top panel. The enhancement in the electron temperature at 05.11 LT is due to sunrise. The anomaly in the electron temperature is called the Equatorial Plasma Temperature Anomaly (EPTA) and is found to occur predominantly around the equinoxes and during the evening hours. The anomaly is characterized by a trough around the magnetic equator with crests on either side. The trough develops before the crests. The anomaly shows a strong dependence on solar activity and is most pronounced when the solar activity is high. Using values modelled by SUPIM, Balan et al. [J. Geophys. Res., 102, 7485, 1997] showed that the anomaly occurs between 19.00 and 01.00 LT at altitudes between 450 and 1250 km and that the anomaly is strongest around 21.30 LT and 950 km altitudes during periods of high solar activity. They also showed that the trough of the anomaly arises from adiabatic cooling of the plasma and increase in plasma concentration caused by the prereversal strengthening of the upward vertical E×B drift. The crests arise from the combined effect of the reverse plasma fountain and nighttime plasma cooling. The electron and ion temperatures, as expected for equatorial latitudes at night, are almost equal and exhibit almost identical EPTAs. Latitude variations of modelled electron temperature for various altitudes at 1830 and 2130 LT. Latitude variations of modelled electron temperature for various local times at altitudes 950 and 650 km. The left-hand panel of the above figure shows latitude variations of the modelled electron temperature for various altitudes at 1830 and 2130 LT. These local times are close to the maximum upward and maximum downward equatorial vertical E×B drift velocity, respectively. The right-hand panel of the above figure shows the time evolution of the latitude variations of the modelled electron temperature at altitudes at 950 and 650 km. The Japanese EXOS-D satellite, renamed Akebono after its launch in February 1989, was launched into an ellipitical orbit with apogee near 10,000 km, perigee 300 km, and inclination 75°. The primary scientific objective of the Akebono project is to investigate magnetospheric phenomena associated with auroral particle acceleration. The Akebono satellite carries eight scientific instruments to carry out this task. Measurements of electron temperature made by the thermal electron energy distribution (TED) instrument on board the Akebono satellite have been analysed and modelled by Professor Graham Bailey and colleagues. The figure below is taken from Denton et al. [J. Atmos. Sol.-Terr. Phys., 61, 775, 1999] and shows the averaged daytime and nighttime profiles at 5°-35° for the northern and southern hemispheres combined from observations made between 1989 and 1995. A detailed analysis of this data shows, amongst other things, that the averaged electron temperature is higher in the northern hemisphere during daytime and higher in the southern hemisphere during nighttime. The cause of this hemispheric difference remains unresolved. Averaged daytime and nighttime altitude profiles of the electron temperature observed at ±5°, ±15°, ±25°, and ±35° by the Akebono satellite. The main heat source for the plasmasphere is solar EUV radiation, the same as that for the ionosphere. However, unlike the ionosphere, most of the plasmaspheric heating arises from energetic photoelectrons. These photoelectrons are produced in the ionosphere by photoionization of the neutral gases and lose energy by collisions with the ambient electrons, ions and neutral gases. Below about 300 km altitude most of the energy is lost locally, but above this altitude the energetic photoelectrons are able to escape along the geomagnetic field lines to heat the ambient electron gas at the higher altitudes and, if the photoelectrons have sufficient energy, the plasmasphere and conjugate hemisphere. Interactions between the high-energy particles and thermal electrons in the plasmasphere are also known to contribute to the heating of the plasmasphere. Modelling studies of the energy balance of the plasmasphere have shown that heating from energetic photoelectrons alone is insufficient to give electron temperatures in agreement with those observed. In Balan et al. [J. Geophys. Res., 101, 21,689, 1996] agreement in the values modelled by SUPIM and those observed by the TED instrument on board the Akebono satellite could be obtained by introducing an equatorial high-altitude heat source into the model. Such a heat source appears to be the only mechanism that can account for the observed electron temperatures. The heat source might arise from the interactions between the high-energy particles and the thermal electrons in the plasmasphere. The principal ions within the plasmasphere are H+ and He+, with H+ being the most dominant. Within the plasmasphere the magnetic field lines are closed. In the equatorial plane, the plasmasphere has a radial extent that varies between about 2.5 and 6 RE, where RE is the Earth's radius. Its boundary is known as the plasmapause. The location of plasmapause is strongly dependent on the magnetic activity of the Sun. During geomagnetic storms the plasmapause moves inwards towards the Earth while during periods of stormtime recovery the plasmapause moves outwards. During the recovery phase the plasmasphere is replenished by plasma that flows equatorward along the magnetic field lines under the forces of diffusion from lower altitudes. The plasmapause is marked by a large and sharp decrease (~1-2 orders of magnitude) in plasma concentration as one leaves the plasmasphere. The plasmapause is essentially the boundary between the plasma that corotates with the Earth and the plasma that is controlled by magnetospheric electric fields. The Extreme Ultraviolet Imager (EUV) on board the IMAGE (Imager for Magnetopause-to-Aurora Global Exploration) satellite images the distribution of He+ in the Earth's plasmasphere by detecting its resonantly-scattered emission at 30.4nm. This emission is the brightest ion emission in the plasmasphere, it is spectrally isolated, and the background at 30.4nm is negligible. Interpretation of the measurements is relatively straightforward as the plasmaspheric He+ emission is optically thin so that its brightness is directly proportional to the He+ column content. The EUV image to the left was taken at 07:34 UTC on 24 May 2000, at a range of 6.0 Earth radii from the centre of Earth and at magnetic latitude 73° N. The Sun is to the lower right, and Earth's shadow extends through the plasmasphere towards the upper left. The bright ring near the centre is an aurora, and includes emissions at wavelengths other than 30.4 nm. GPS is subject to inaccuracies due to the effect of the ionosphere on the propagation of radio signals. A correction for the ionosphere can be made when dual frequency receivers are used. However, many navigation uses of GPS rely on inexpensive single-frequency receivers with compensation for propagation effects being made through the use of an ionospheric model broadcast by the GPS satellites. Such models are usually based on measurements of total electron content or maximum plasma concentration. Measurements of this kind are dominated by the plasma in the ionospheric F2 layer so that little account is taken in the GPS correction models of the contribution of the electrons on the long raypaths through the plasmasphere. The effects of the H+ dominated plasmasphere on GPS have been largely neglected and it is only recently that significant effort has been devoted to this topic. Several modelling studies to assess the importance to GPS users of the electron content in the plasmasphere have been carried out using SUPIM, the Sheffield University Plasmasphere Ionosphere Model, by Professor Graham Bailey and colleagues. In a study by Bailey et al. [Proceedings of the 1999 Ionospheric Effects Symposium, Alexandria, Virginia, 663, 1999] model calculations have been carried out for the GPS raypaths of 7 March, 1999, that originate at Westford, Massachusetts (42.6°:N, 71.5°W). On this day F10.7 was about 120. Nighttime GPS slant TEC as observed from Westford, Massachusetts, to satellite 23 on 6 March, 1999, together with the modelled values of slant TEC and the O+ and H+ slant contents. On the right are shown the satellite track as viewed from Westford and the L-shell contours. Shown in the above figure are the observed and modelled slant TECs (Total Electron Content) and the modelled O+ and H+ slant contents along the raypath from Westford to satellite 23. Also shown are the L-shell contours with respect to Westford and the satellite track as viewed from Westford. The circles about the station represent elevation angles of 5°, 30°, 60°. There is good agreement in the modelled and observed values of TEC. This figure shows that the modelled values of H+ content are higher at the beginning and end of the pass in response to the satellite crossing through lower L-shells when the satellite is south of Westford. On this nighttime pass the modelled H+ contents are about equal to the O+ contents around 04.00LT, ie, about 50% of TEC is due to the plasmaspheric electrons. The results for other passes also show greatly varying percentage contributions to TEC from the H+ ions. The contribution of the plasmaspheric electrons to TEC varies strongly with viewing direction and neglect of the plasmaspheric electrons may lead to errors in the range delay at the L1 frequency of 1-2 metres. The greatly changing percentage contribution of the plasmaspheric electrons with viewing direction has potential implications for the assumption of a fixed height thin shell model, commonly used in converting slant TEC into equivalent vertical TEC. GPS observations of TEC are offset by unknown biases arising from delays in both the satellite transmitter and the ground-based receiver. Analysis techniques have been developed that use observations from several satellites to obtain corrected absolute values of TEC. Various attempts have been made to verify such techniques using independent measurements, but the difficulties in obtaining exact correspondence in space and time has limted the accuracy of the comparisons. In Bishop et al. [Proceedings of the 1999 Ionospheric Effects Symposium, Alexandria, Virginia, 151, 1999] and Lunt et al. [Radio Science, 34, 1261, 1999] simulated measurements of TEC along GPS raypaths have been generated by SUPIM. The simulated measurements, offset by arbitrary biases, were then used to verify the self-calibration of pseudo-range errors (SCORE) process [Bishop et al., Proceedings of the IEEE 1996 Position, Location and Navigation Symposium, Piscataway, New Jersey, 145, 1996] used to estimate TEC and satellite biases from the GPS transmissions. It was demonstrated that, with appropriate modification to compensate for the effects of the electrons in the plasmasphere, the SCORE process can be used to determine TEC to a high degree of accuracy. These studies have also demonstrated that there are small differences in the GPS measured values of TEC due the plasmaspheric TEC on GPS raypaths looking north and south from a mid-latitude European station. The thin shell models of the ionosphere used in GPS TEC work fail to replicate these asymmetries. At American longitudes, because of the tilt of the Earth's magnetic field, the the differences are expected to be much smaller [Lunt et al., Radio Science, 34, 1281, 1999]. While extensive studies have been carried out over several decades on the effects of the ionosphere on satellite-to-ground propagation paths very little work has been done on ray paths involving links between satellites. However, with increasing use of radio systems for practical applications, particularly satellite-based navigation and positioning, interest is now turning to propagation effects on satellite-to-satellite paths. One specific aspect driving such investigations is concern over future requirements for the station-keeping of satellites in the commercially very important, but potentially congested, geostationary orbit. Geostationary satellites are currently tracked using a network of ground stations. A future possible development could involve positioning by making use of a satellite navigation system, like GPS. In a study by Kersley and Bailey [Radio Sci., 40, RS4008, doi:10.1029/2004RS003096, 2005], SUPIM has been used to estimate TEC along ray paths between satellites for conditions appropriate to solar maximum. It was found that, in general, for ray paths through the plasmasphere, where the satellite-to-satellite geometry is far removed from eclipse by the Earth's horizon, the TECs are generally less than 20 TECU with resultant errors in positioning of only a few metres. However, when the rays intersect the equatorial F2 region at near grazing incidence close to the F2 peak, TECs of up to some 2000 TECU have been found, with potential propagation delays of hundreds of metres. The exact magnitude of the TECs are very dependent on the precise geometry of the raypath and vary with time. Every effort is made to keep the information on these pages accurate, but this is not a guarantee that it is correct. Pages last modified on 30 October 2008. These pages created and maintained by Professor Graham Bailey.